North Korea has alarmed the international community by the pace and progress of its missile development program, and this month leader Kim Jong-Un conducted two tests of an ICBM. Washington: North Korea could field a nuclear-capable intercontinental ballistic missile able to strike America by next year, but Pyongyang must first overcome important technological hurdles, a US expert warned Monday. The first of these trials, which Kim described as a gift to "American b******s," showed the rocket had the potential range to hit Alaska. But a second rocket test last week flew even longer and could have reached as far as America's West Coast, experts say. Michael Elleman, of the International Institute for Strategic Studies and the 38 North Analyst think tank, said it appears that the "re-entry vehicle" that would carry a warhead back into Earth's atmosphere from space had failed during the second test. "Most likely it broke up into pieces," he said. "Prior to completely breaking up, it appears to have been shedding some of the outer layers, and then it must have finally disintegrated." Elleman's assessment was based on video shot in Japan's Hokkaido that shows an object in the night sky breaking up at an altitude of about six to 2.5 miles (four to 10 kilometres). Without a proper protection during a re-entry stage, a missile's warhead could burn up. Still, Elleman said Pyongyang is learning fast and that depending on North Korea's testing schedule, a deployment next year is possible. 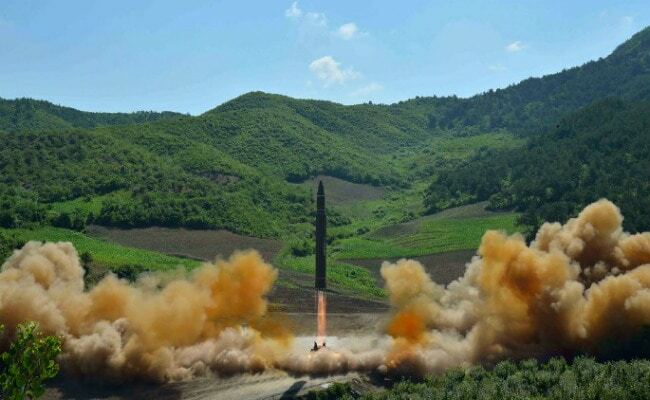 Citing US officials, The Washington Post last week said the Pentagon's Defense Intelligence Agency (DIA) now believes North Korea will be able to deploy an ICBM capable of carrying a nuclear weapon as soon as next year -- two years earlier than the agency's previous estimate. "I tend to believe the recent (DIA) assessment that, by late this year or sometime next year, they should have a system that's what I call 'reliable enough,'" Elleman said in a conference call with reporters.